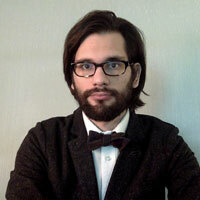 Brian Hawkins is a pianist and visual artist from Kansas City, Missouri. He received his Bachelor of Arts in Studio Art and Art History from the University of Missouri-Kansas City in 2011 and his Masters of Fine Arts at the University of Kansas in 2014. Early in life, he was fascinated by ragtime, a syncopated precursor to jazz that developed at the turn of the twentieth century in Missouri. He began actively researching and performing the genre as a teenager, which resulted in an award-winning documentary about the composer James Scott. Brian has performed at numerous festivals, including the Scott Joplin International Ragtime Festival. His combined interest in music, drawing and film led him to produce stop-motion animations for which he composes the musical accompaniment.